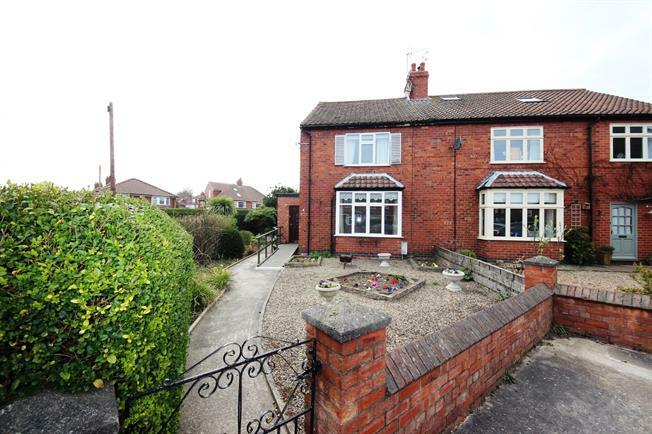 3 Bedroom Semi Detached House For Sale in York for Asking Price £350,000. Located just off Bishopthorpe Road at the end of a sought after cul de sac this three bedroom semi detached family house has a large corner plot and offers scope for improvement and extension subject to planning, comprising: three bedrooms, spacious double aspect living room, dining room with double glazed sliding patio doors to the rear garden, double aspect kitchen with integrated oven and hob, small ground floor side extension, entrance hallway, first floor bathroom, gas central heating with modern Worcester boiler and uPVC double glazing. Externally the large corner plot garden has a paved patio, pond and is enclosed by mature hedging with rear access to a detached garage and a car port. Vacant possession.